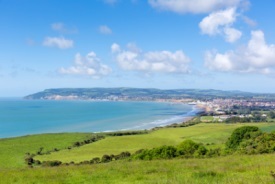 The Isle of Wight rests off the southern coast of England and approximately 2 hours from London via ferry. With seasonal festivals and beautiful beaches, there is plenty to see and do whether you are on a romantic getaway or a family vacation. Visit museums and galleries to learn the history of the area, or visit the most recognizable landmark, the Needles Rocks and Lighthouse. With some of the best beaches England has to offer, a trip to the Isle of Wight wouldn’t be complete without spending time relaxing in the sun and splashing in the water. Other notable activities include walking trails, horse-riding, a weekly Farmer’s Market, and various water sports.